The bulls that were sold for D50K last year, now cost between D5 and D7 lakh; owners not keen on sale as they think Jallikattu bulls are status symbols. Earlier as the bulls aged three to four years were sold for around Rs 50,000. Now a bull in that age group costs as high as Rs 1 lakh. Similarly, Jallikattu bull’s calf during the past two years had been selling between Rs 2,000 and Rs 3,000 per calf. Now the rate can go up to Rs 15,000. “A week ahead of the commencement of organised jallikattu, I sold one of my young bulls for Rs 36,000. Now, the price is estimated at Rs 1.5 lakh. 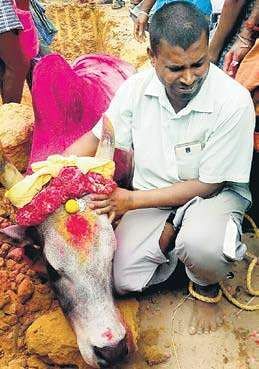 Young boys in our village have been pestering their parents to buy them a Jallikattu bull calf to participate in future events, thus increasing the demand even among the families that are not used to raise such bulls in the past,” said U Chelladurai (31), a Jallikattu bull owner hailing from a place near Guntur. He added that drought condition has been giving a tough time for the bull owners to rear the animals, with the owner spending Rs 20,000 per month to source cattle feed and water for the animal considered as a member in their family. 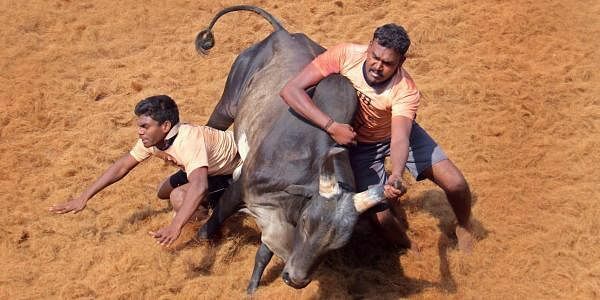 Owners of successful Jallikattu bulls boast about their animals by coming up with DVDs showing their bulls breaching the fortress of bull tamers in the arena. “Many Jallikattu bull traders are willing to spend lakhs by seeing the performance via DVDs or Youtube videos. They tour the villages known for conducting Jallikattu in search of the right bull,” Chelladurai said.